First off, let us get the nasty colour-scheme cover out the way – and why is Ezekiel in the middle pinned in by 2 perspectives of the pivotal scene of the issue? Ezekiel is around for a negligible amount of panels in issue 123. So why does he get star billing?? Anyhow – here we are, issue 123! ‘Chapter’ 9 of 12! Or, if you prefer (as I do) part 9 of 12! Almost there (I say it through gritted teeth). If I had to summarise this issue in one breathless line without punctuation, then it would go a little something like this…..issue 123 drags and drags with the usual talking and emoting until we get to the bit where Negan swears and then the fighting starts and that’s all a bit confusing until suddenly Negan has an opportunity to kill Rick but he hands that golden opportunity to Dwight who shoots Rick with a potentially zombie infected bolt. So what’s wrong with the issue? In my opinion it is insubstantial. Nothing really grabs the attention, not even the fighting (which to be honest I am sick of now – countless skirmishes and raids on the other sides fortresses / compounds / communities). Just get it over with now. The rest is talk. Talk about feelings. Talk about loss. Then Rick talks optimistically. There is a small few panels about Carl and Sophia meeting up again that doesn’t work out too well for Carl but that was pretty interesting for me as a reader. The rest isn’t as good. It just riffs on stuff that has been covered before (talking about feelings, talking about loss etc). And then there is some pages of Negan swearing / shouting / swearing and shouting over the top of a wall wanting to speak to Rick. Sound familiar? Damn right. That is because you have seen it several times over the last few issues. The battle scenes are confusing. Most of the time Adlard frames fighting really well. Not this time. This layout felt confusing. I had no idea how Negan and Dwight managed to get behind Rick. It didn’t seem to make much sense – how could Rick be that dumb to not have people watching his back? But it is all for a reason. That reason is to provide the big talking point. Rick gets injured. Rick might die. Sound familiar? That is because you have seen it several times over the last 123 issues. And as usual, it is not clear cut. It is a tease. Not for Rick the clean cut death of Abraham Ford. Oh no, with Rick Grimes there is always the ‘but’, always the ‘maybe’. Maybe Dwight, who fired the fateful shot, didn’t infect his bolts (or some of them) with the dead. But maybe he did and his posturing of being a double-agent on Ricks side was nothing more than a bluff. 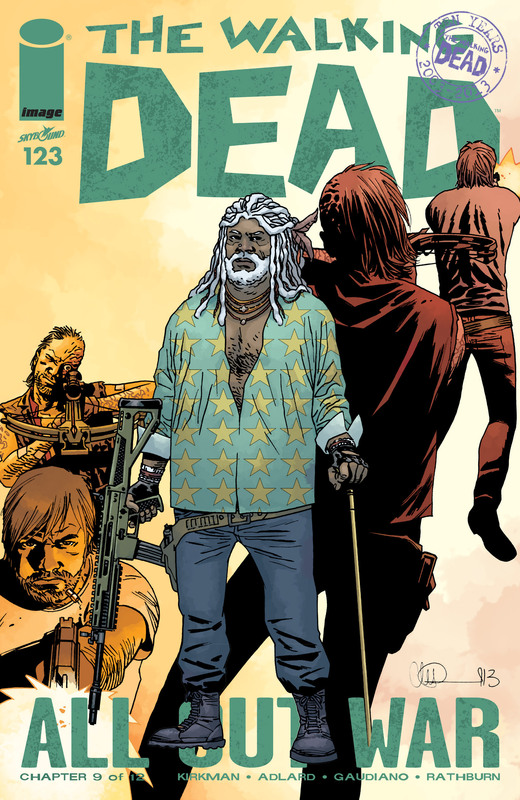 Kirkman wants you to carry on reading so these things are engineered to make you want to buy and read issue 124. But maybe the outcome for Rick will not be known for 2 or 3 issues, as we have not yet reached the culmination of this drawn out All Out War. I think I am about All Out of patience with it (this arc, this ‘War’). It is not working for me when I had really high hopes that this could carry on at a high tempo consistently throughout the arc, 12 issues is just too long. And the ‘is Rick dead?’ plot device has been literally done to death. It has lost its shock value because it’s a death by a thousand cuts, a long drawn out death stretched over 123 issues and can someone now put Rick Grimes out of his misery? And Carl, and most of the others (I would personally like some such as Michonne and ‘Jesus’ to be saved as they still have characters worth exploring). Maybe Kirkman has gotten tired of these characters too and maybe – just maybe – the fallout from All Out War is a whole new cast. That could be the positive to come out of this arc.